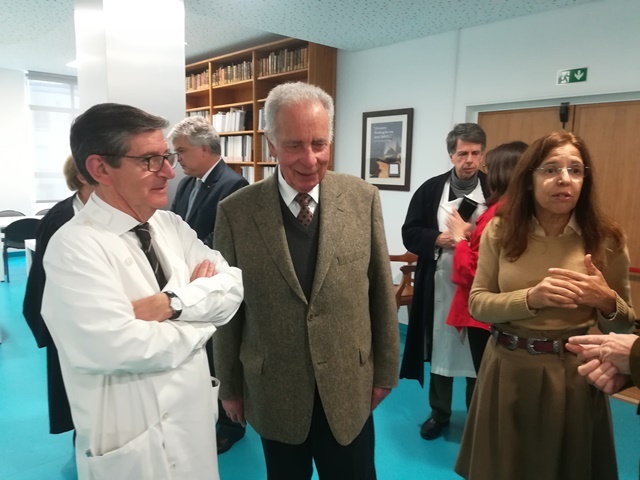 Today, we associate the following motto with the Faculty of Medicine of the University of Lisbon: “A School that honours the past and builds the future”. For more than a century, FMUL has been the only institution of higher education in medicine in Lisbon and the one that has produced the most doctors by far. And the role of the CDI Library has obviously been integral to this reality. 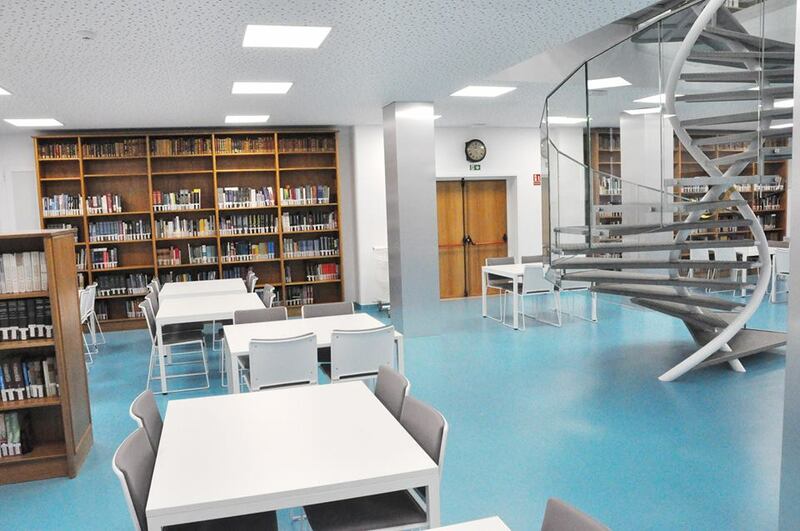 The history of the CDI Library begins, like that of the Faculty itself, long before its transfer from the Campo dos Mártires da Pátria (which currently houses the Faculty of Medical Sciences of the Nova University of Lisbon), to the Santa Maria Hospital, opened in 1953. It is, in fact, one of the oldest university libraries in the country. Its collection, namely the core of old books, with works dating back to the fifteenth and sixteenth centuries, helps us to reconstitute this history. Without going back to the beginnings of medical education in Lisbon around the thirteenth century, the truth is that we must at least mention the predecessors of FMUL, the Royal School of Surgery and the Medical-Surgical School of Lisbon as the predecessors of the Faculty of Medicine, created, by decree of 1911, in the dawn of the Republic. 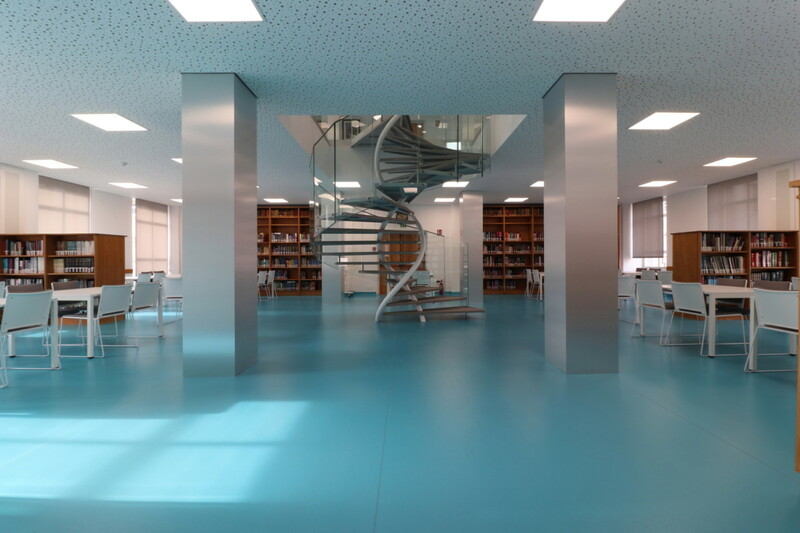 The evolution of sciences and informational and communicational technologies is also reflected in the way in which we think of libraries today, the concept itself (think of digital libraries), their spaces and their offer. Much more than a simple repository for bibliographic spoils, today’s libraries offer their users access to vast online digital resources. In the case of a university library specialising in medicine, the investment in these resources is a priority and, referencing only some of the most important resources, the CDI Library currently offers its users access to hundreds of e-books (of which we would highlight the Harrison’s Principles of Internal Medicine) from Access Medicine, Acland’s Video Atlas of Anatomy, as well as databases and e-journals, all of which are indispensable support for medical teaching, clinical practice and research. 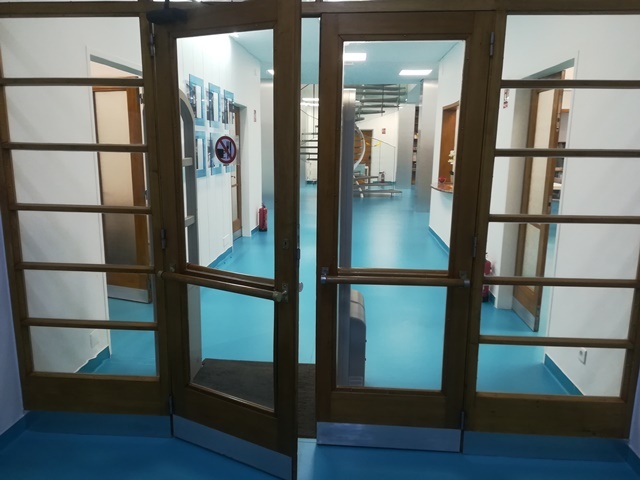 The remodelling job of the CDI Library’s physical space, in Floors 6 and 7, did not constitute an easy enterprise and required an enormous effort of coordination of all the working teams involved, from the CDI Library Team, Facilities, Equipment and Logistics Unit, Administrative Management Department, Management, Executive Director, among others. 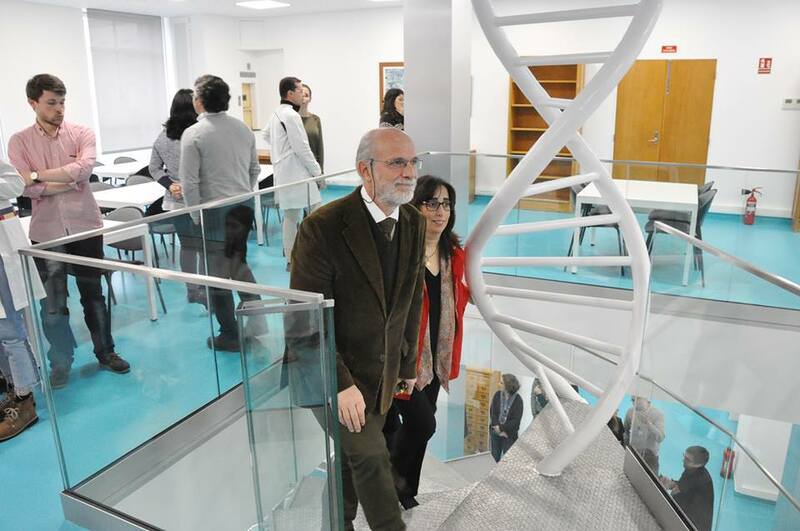 The coordination of the work also involved the Santa Maria Hospital. 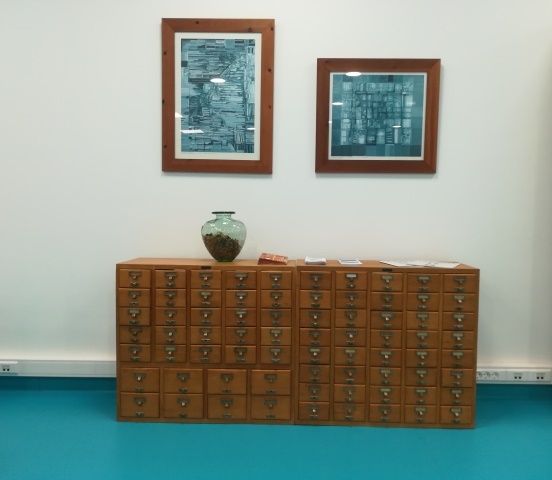 The new space now has two floors, providing users with a room in a renovated space that previously functioned as a book deposit. 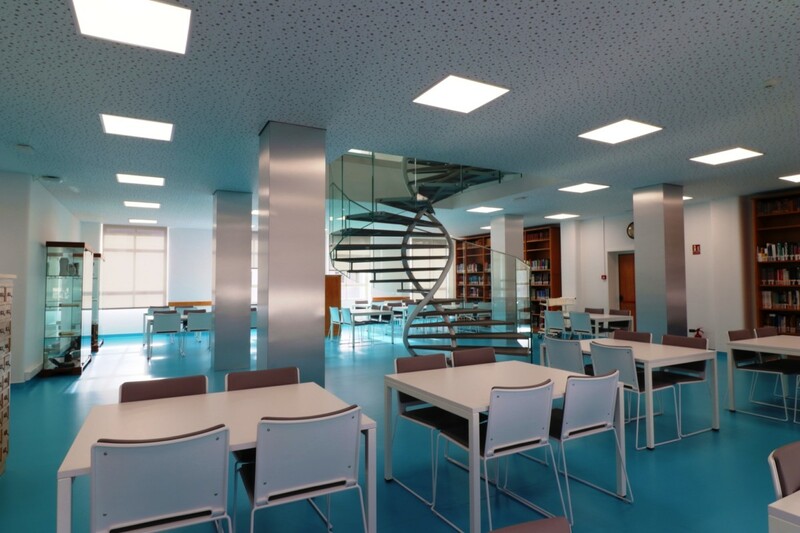 Of course one of the aspects that draws the most attention from those who visit the Library for the first time, as well as from previous users, is that the spiral staircase evokes the DNA helix, visible in the photos. At its inauguration on April 12th, the Director of the Faculty, Professor Fausto Pinto, Professor António Vaz Carneiro, Dr. Susana Henriques, coordinator of the Library and Information Centre, Dr. Luís Pereira, Executive director, Dr. Isabel Aguiar, from the Department of Administrative Management, along with several other colleagues, students, teachers, etc., were all present. “There is no doubt that in the last twenty years there has been a great evolution in relation to what is the very concept of library. 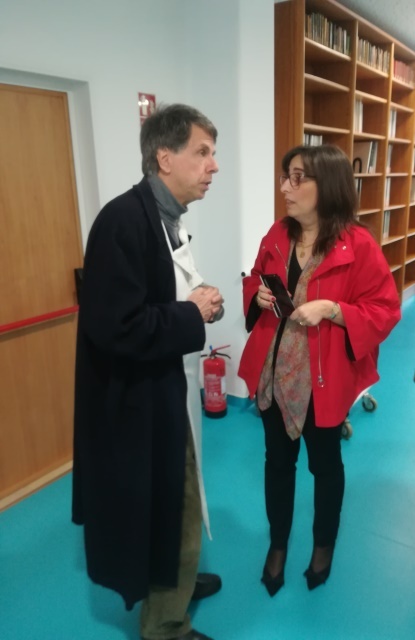 with networks, anyone with a smartphone connects to the library, the Library has become something different … but it remains fundamentally a place where our students, teachers and doctors’ needs in the area of health sciences and biomedicine. sciences, are supported. «What we idealised from the beginning was to create better conditions for the users, as we exist for them. For many years we struggled with the lack of physical space. As of 2008, the bet on digital resources allowed us to overcome this limitation. As an alternative for promoting remote access and for the autonomy of users in accessing information, it will always be a complement. The Library as a physical space remains a necessity. Our ambition was to construct a building from scratch, but this was the possible alternative and the result was very positive. This was the work of a united and cohesive team. We are twelve colleagues who, although dispersed by several points that include the Morphological Sciences Centre (Floor 1), the Self-Learning Room (Floor 6), the Reading Room (Floor 6 and 7) and the Treatment Room (Floor 7), are able to maintain a true team spirit, be supportive and obtain the best answer to each new project, challenge or goal. About the construction job, it is important to say that we began to dismantle the 7th floor deposit at the beginning of last year and work began in September. We are talking about the dismantling of a 500m2 warehouse area, which was not very easy, but was very advantageous to the extent that it allowed us to make a selection, evaluation and reorganisation of all the documentation that existed there. It was an almost painful work, but very important because it allowed us to donate or eliminate duplicate/triplicate documentation, locate and identify works of great importance that were not yet treated – given their historical heritage, we still have a large estate to deal with, regarding the old books. 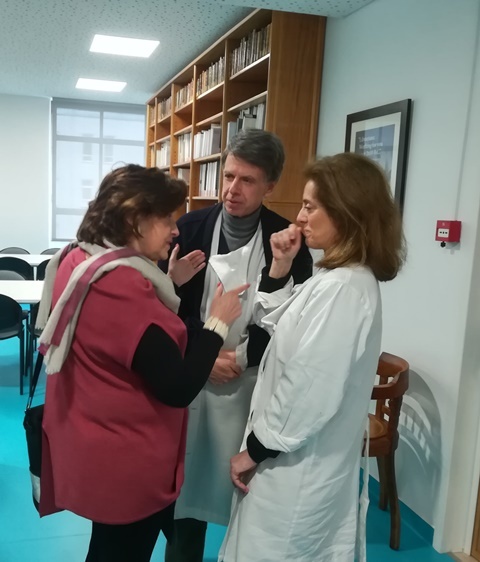 I must also mention the extraordinary support of colleagues from other units who greeted and welcomed us during the performance of the construction job: Departments of Surgery, Preventative Medicine, University Clinic of Psychiatry, providing the best working conditions in this transition period. I took great pride in being able to do all this transformation without ever stopping the Library services. Alternative study spaces were found and support for the user in access to information was guaranteed. 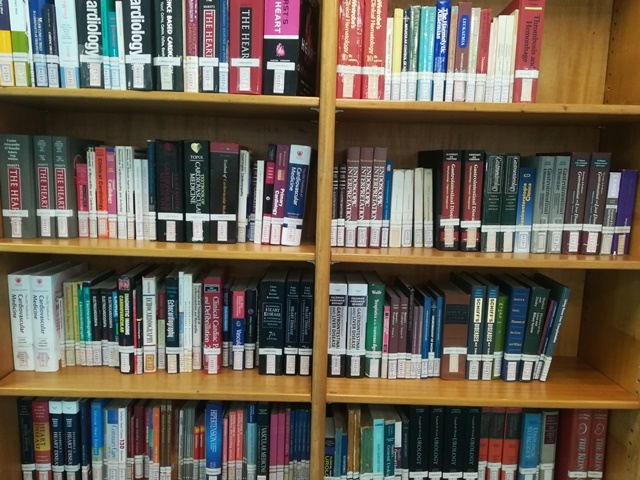 When we received requests for documentation that was inaccessible due to the construction job, the answer was obtained with the support of other libraries with which we maintain protocols of collaboration in the scope of the Interlibrary loan. Still within the scope of the construction job and taking advantage of the greater availability of colleagues from the technical treatment service, we were able to start processing the libraries of the Institute of Physiology and the University Clinic of Psychiatry, since supporting the sectoral libraries is also part of our mission. 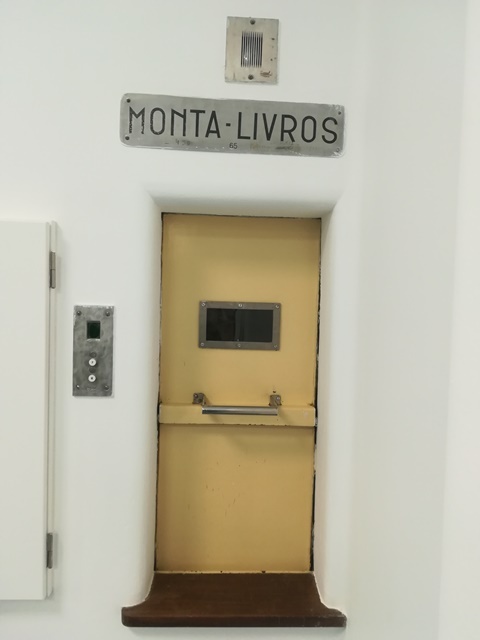 «A remodelação da biblioteca surgiu de uma ideia do Dr. Luís Pereira. 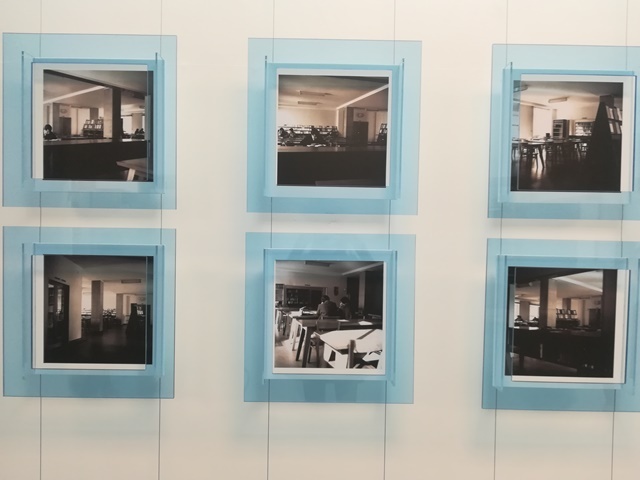 O piso 7 estava há anos a servir de depósito. Um dos nossos problemas é a falta de espaço. Com particular incidência em espaços de estudo com o “silêncio” que a atividade necessita. O Dr. Luís Pereira lembrou-se, “porque não aproveitar o piso 7 e fazer desse espaço um espaço de estudo?” O espaço tinha centenas de livros em dezenas de estantes e tirar tudo foi uma dor de cabeça, principalmente para a Dra. Susana Henriques, Coordenadora da Biblioteca. Tudo começou em 2016. 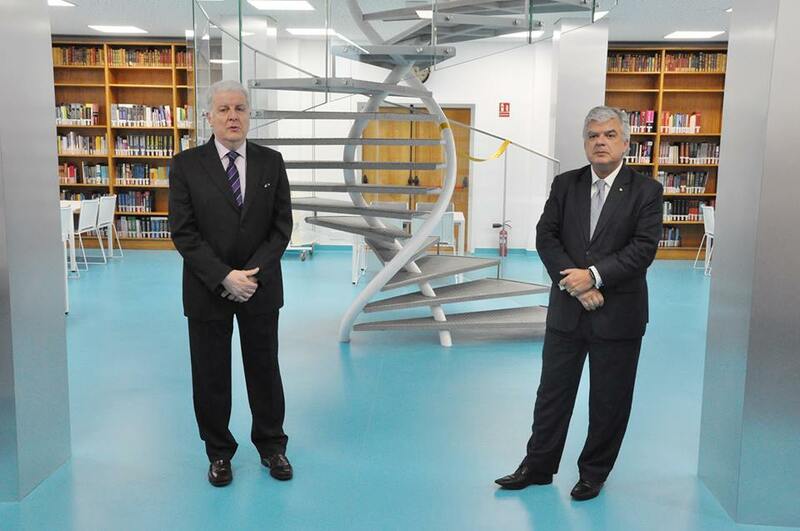 «The remodelling of the library was idealized by Dr. Luís Pereira. The 7th floor had been serving as a deposit for years. One of our problems is the lack of space. With particular incidence of study spaces providing the “silence” that studying requires. 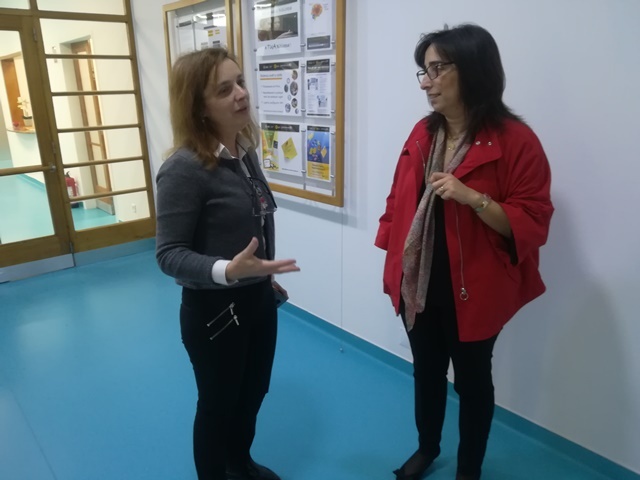 Dr. Luís Pereira thought: “why not take advantage of the 7th floor and make this space a study space?” The space had hundreds of books on dozens of shelves and taking everything away was hard work, especially for Dr. Susana Henriques, Library Coordinator. It all started in 2016. Everything in that space had a lot of value, the shelves themselves are Olaio furniture. This means that when we change something in this faculty we are moving history, heritage with great value. Dr. Susana made a very exhaustive survey of the material that was there and did the sorting of everything that could be interesting to keep or not. Later we contacted a project team that had once done an excellent job at the Faculty of Law. 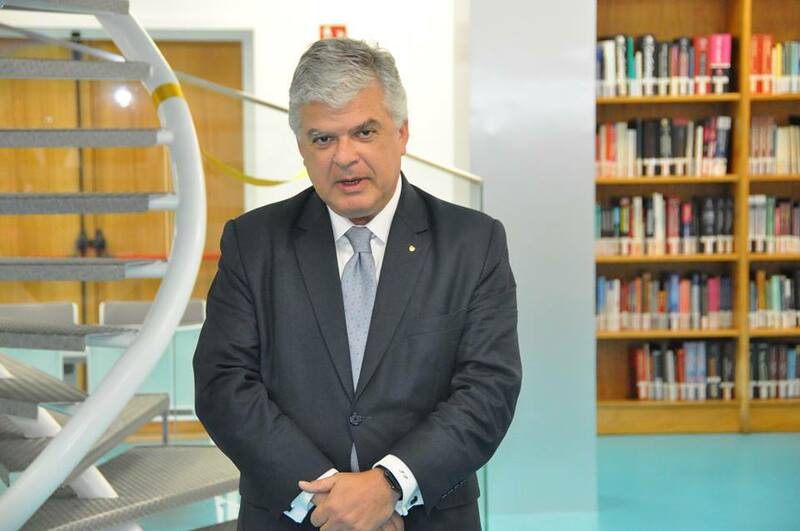 We contacted this company and worked together with architect Rui Paiva. The process, at first, was a little time consuming, as the architect took some time to idealise the space. 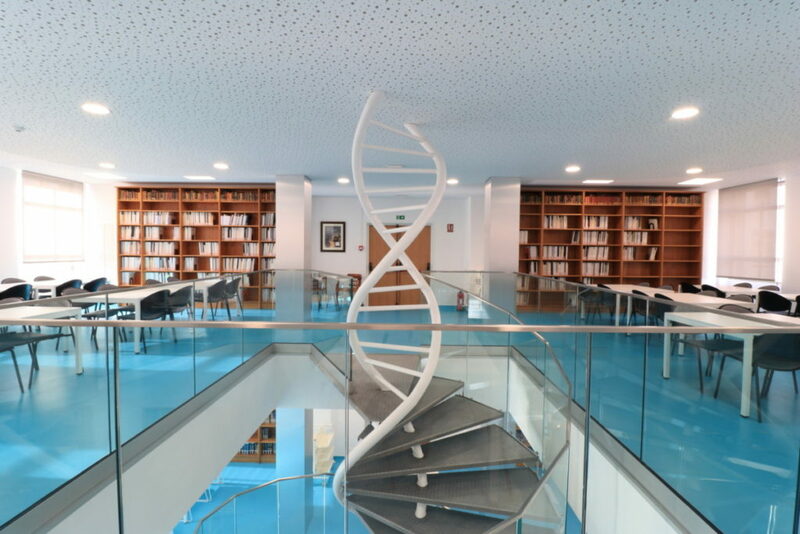 The idea comes from the staircase, it’s the masterpiece of the library, representing DNA. Dr. Susana, Dr. Dina Guerreiro and I were very excited, we thought the idea was fantastic. After the authorisations, we continued to the tender. Not that many companies participated due to the complexity of the staircase. In addition, and for the first time, the hospital slab would be open. The day they opened it, I was on my way to Braga to celebrate my godmother’s 50th wedding anniversary, and I had Mr. Costa sending me photographs as the breaking process was taking place. I was feeling more and more at ease because it was going well, and the safety conditions were guaranteed.